Try your first month of Field to Cup‘s Tea Discovery Plus Box for 66% off! Field to Cup‘s Tea Discovery Plus Box sends you 7 high quality and delicious loose leaf teas to try every month (enough for 48+ cups). 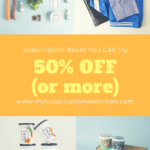 Membership perks include 40% off every month from the teas in your box, 15% off all other items in their store and Free tea replacement for any tea you don’t love. You’ll also receive a Steeping Guide every month that gives you detailed preparation methods, expert tasting notes and more. Yay! Just signed up! So excited to try this…I was planning on signing up anyways so this is just awesome!